Number Forty has recently been refurbished to a very high standard. It is light and airy with a coastal style. New for 2019, refurbished double bedroom plus new dishwasher and freezer. The holiday bungalow is part of the Linstone Chine Holiday village located between Colwell Bay and Yarmouth on the beautiful west coast of the Isle of Wight. The bungalow is minutes from the beach and a coastal path that can take you all the way to the Needles and Tennyson Downs if you are feeling energetic. It is also possible to walk to Yarmouth through the Fort Victoria Country Park where there are some great coffee shops, a deli and lovely restaurants. Colwell Bay Beach is a blue flag beach and perfect for children, there are plenty of rockpools for crabbing at low tide. The sea is also very shallow for a very long way out - making it perfect for paddling for the little ones. It's also great for body boarding for the not so little ones. We have installed broadband so internet access is excellent and reliable (as well as free). There is a PS3 and Wii as well as a good selection of games, books and DVDs. We have included little extras that we would expect when we stay away, such as plug sockets with USB charger sockets in the sitting room and double bedroom. The patio has a lovely comfortable rattan effect dining set. Perfect for enjoying a coffee in the morning whilst watching the cows in the adjacent field. 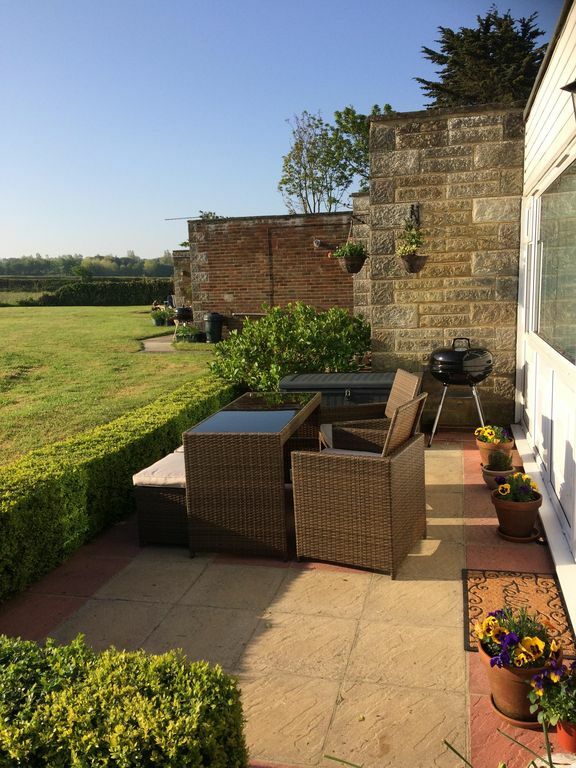 Whilst the patio does not have sea views, it has lovely rural views and is sheltered from the coastal breezes making it ideal for enjoying a glass of wine or for BBQs in the evening. A selection of outdoor toys, body boards, beach toys and deck chairs are provided. There is a parking space directly behind the chalet. We have also provided the following items for babies/toddlers so that you have less to pack. High chair, dining booster seat, toilet training seat, bathroom step stool, changing mat, blender, plastic cutlery, cups and plates. The facilities on site include a small shop, launderette, playground, crazy golf and football pitch. We have been letting the property for three years and have had many positive comments about how lovely the décor is and how well equipped the chalet is. This is an example of the many positive comments from our visitors book. "We absolutely love Number 40, it is exactly as we hoped it would be (and better!) and we are hoping to come back for a longer stay next year." Mrs M.
My family and I bought number 40 in 2015 so we can enjoy holidays together on the lovely west coast of the Isle of Wight. It's so peaceful but within easy reach of local towns. We love running and cycling - you can be on some great coastal paths within minutes of leaving the property. The sunsets in the evening are amazing. Lovely site and beautiful accommodation. Wonderfully presented and extremely well equipped. Comfortable beds and very clean. None of us wanted to leave. Couldn’t have asked for more. The beach is great and only gets better when the tide goes out. Will be visiting again. Excellent location, property perfect clean , tidy everything you need. Couldn't fault at all . Would book again with out any hesitation. The property was excellent there was everything you could have needed and more. so close to the beach so lovely walks along the beach. Beautiful sunsets and fabulous weather. Peaceful and clean. Really enjoyed our stay. Warm, cosy and very comfortable. Perfect for families and couples. Such a lovely chalet, in a perfect location. Very comfortable and everything that you could think of and more is supplied to make your stay that much more enjoyable. I will definitely be coming back. My husband, our six month old little girl and I had an absolutely brilliant holiday on the Isle of Wight. Anita’s place is just beautiful and had everything we needed....she was even able to sort out a travel cot for our daughter to sleep in. We bbq’ed a couple of times at lunch and cooked in every night. A very tranquil holiday site and perfectly located near the village of Freshwater which has a great leisure centre so we could take our daughter to the pool. Really loved exploring the island...will definitely be back!